New year eve was excellent. Strolling at 1-Utama, visited DiGi's New Year Eve Celebration, and "redeemed" a cute "hand"! 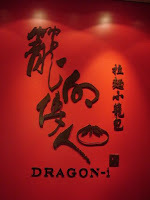 Then, supper at Dragon-i Restaurant. Oh my... exquisite! Meddling with mobile phone, sending & receiving new year greetings. Never mind! As for now, I can't wait to go to Singapore this weekend! Going to attend my pal's wedding. Yay!! Good for her.